That's right! 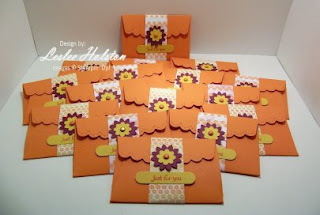 You will have to book a workshop to look inside one of these adorable scallop envelopes! It's really easy to obtain one of these envelopes. All you have to do is book a workshop with me to be held by October 31, 2009. You will then get to choose an envelope. The contents of the envelope will only be revealed at your workshop in front of your friends and family! I can promise you this...you won't be disappointed at what you find inside your envelope! There are some real goodies hidden inside these little beauties! Contact me today to schedule your workshop. Need 3 more reasons to hostess a workshop? Simply click HERE! 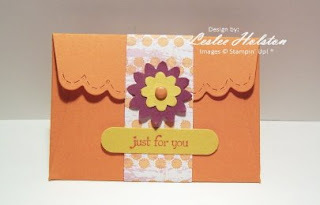 As you can see, these were mass produced in Pumpkin Pie card stock using my Big Shot and the Scallop Envelope die. I wrapped a 5" x 1" strip of Razzleberry Lemonade Designer Series paper around the envelope. The flowers are punched in Rich Razzleberry and Crushed Curry using the Boho Blossoms punch. A pumpkin pie brad holds the flower together and a mini glue dot holds it on the envelope. The sentiment is stamped in Pumpkin Pie ink from the Teeny Tiny Wishes set, punched in Crushed Curry using the Word Window punch. Inside (which I can't show you until your workshop) holds a 3" x 2" card. Perfect for a stamped sweet sentiment or small note. It would make a lovely Valentine's swap for an entire classroom! Change the colors and replace the flower with hearts! Yes! You need this Big Shot & die!! Hold a workshop...I'll help you get some of these goodies for FREE! Thanks for coming by today! I hope you've been inspired to book a workshop! Come back soon for more!